A fully featured Microsoft Lync/Skype for Business system for your small meeting rooms, the Crestron RL 2 for small conference rooms enables you to extend your Skype for Business communications experience into your small and midsized conference spaces to connect people everywhere and achieve more, together. The fully-featured room system enables the highest quality collaboration to take place on conference room displays rather than laptops. 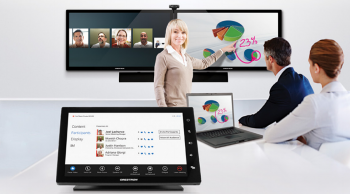 With one touch of a button, anyone can walk into the meeting room and collaborate. Share your desktop with local and remote participants, view and annotate over presentations and use the 60″ touch displays as an interactive whiteboard. The Crestron RL 2 package for Small Meeting Rooms provides a complete tabletop Crestron RL 2 system for meeting room of up to 8 people. The system can include single or dual 60″ displays, and the wide angle HD camera and 360 degree speaker/microphone solution enables full view and audio coverage for superior meeting video & audio quality. 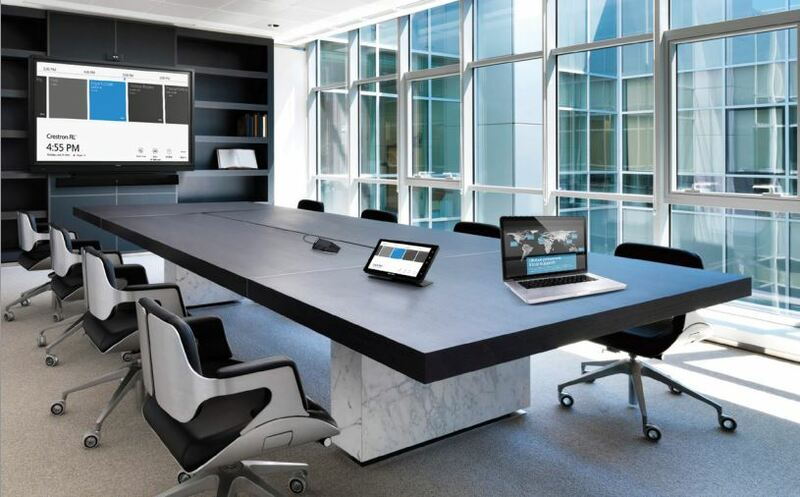 10″ tabletop touch screen – includes a Crestron control system that can be tailored by our inhouse & accredited programming teams to provide full intuitive management of your collaboration sessions alongside control of room lighting, shades, climate and AV equipment. HD Camera – Choose from either the Crestron USB camera or a whole host of third-party accessories that have been tested and approved for use with the Crestron RL 2. Auto-switching – the Crestron RL 2 allows versatile connectivity for computers and other content source devices, and auto-switches between sources to simplify operation. Audio – With a choice of high performance, low profile USB microphones or professional analogue microphones and the option to include a soundbar, your system can achieve excellent pickup of meeting participants and everyone can be heard in crystal clear quality. Mobile cart – A mobile cart option provides an attractive, high adjustable design which can be moved from room to room or positioned within a multi-purpose space. See the Crestron RL 2 product overview page to find out other Crestron RL2 packages available for your rooms. Or, head on over to our Skype for Business Solutions page for more suitable options for your business.